Esthesioneuroblastoma’s are a rare malignant tumor originating from olfactory neuroepithelium. They occur over a broad age range with most patients presenting in their fifties and sixties. The presenting symptoms are based on the location and extent of the neoplasm. The most common symptoms are nasal obstruction, nasal bleeding, headaches, facial pain and decreased sense of smell. Tumors involving the eye may lead to double vision, proptosis (swelling of the eye) , tearing and decreased visual acuity. If the tumor spreads intracranially neurologic symptoms such as headaches, nausea, vomiting and seizures may occur. Additionally some patient develop ear pain and decreased hearing secondary to obstruction of the eustacian tube resulting in a serous otitis media. Evaluation of esthesioneuroblastoma includes nasal endoscopy and biopsy. Additionally, radiographic imaging is performed to assess the extent of the tumor. 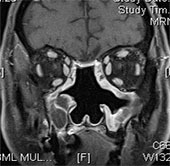 Initially a CT scan is performed to evaluate the bone destruction along the paransasal sinuses, the bone to the eye (lamina papyracea) and bone to the brain (cribriform plate). An MRI is also performed as this allows for better evaluation of soft tissue disease including any extension into eye or brain. Additionally, once a diagnosis is made, a PET/CT scan is usually performed to evaluate for any spread either to the lymph nodes in the neck or more distant spread to other parts of the body including the liver and lungs. Treatment is generally multimodal which includes a combination of surgery, chemotherapy and radiation therapy. Given the rarity of this type of tumor, a number of centers have tried different combinations of therapies in different orders. Most centers treat this tumor with surgery followed by chemotherapy and radiation therapy. Given the small number of patients treated annually in the U.S., it is recommended that treatment should be done at a center with a large volume of experience both surgically and with dedicated skull base oncology teams for best long-term outcomes. Previously surgery was often performed with an open craniofacial resection (including facial incisions) as well as a craniotomy often performed by a neurosurgeon to remove any intracranial portion of the tumor. Currently, centers with large volumes perform these completely endoscopically with specialized neurosurgeons who perform the intracranial portion endoscopically as well to avoid a standard craniotomy or facial incisions. This has led to decreased complications and shorter hospital stay. 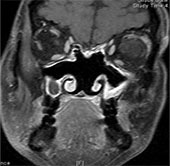 52 year old male previous history of smoking but nonsmoker for past 10 years presents with new onset nasal obstruction on the left side. He was initially seen by his primary care and put on 2 course of antibiotics and then referred to an otolaryngologist for further evaluation. 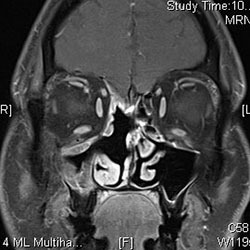 Upon examination he was noted to have a large left-sided nasal mass which subsequent CT scan demonstrated concerning for malignant tumor. Biopsy was positive for an esthesioneuroblastoma. He was sent to a large volume tertiary care institution for further management. He subsequently completed an MRI (Figure 1). Subsequent PET/CT scan demonstrated no evidence of metastatic spread to the neck or other structures. 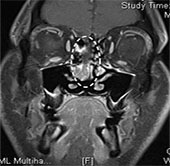 He subsequently underwent an endoscopic resection in combination with an endoscopic skull base otolaryngologist and neurosurgeon including removal of bilateral olfactory bulbs (Figure 2). He was in the hospital for 2 days without any complications. The pathology demonstrated complete removal and he followed this with chemoradiation therapy. He is currently 3 years out from surgery without any evidence of recurrence. 60 year old male otherwise healthy presented to outside institution with an esthesioneuroblastoma. 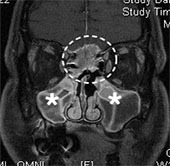 They attempted an endoscopic resection but unfortunately could not perform a complete resection leaving tumor both in the sinus and brain (Figure 3). Prior to starting chemotherapy and radiation therapy, he came for a second opinion at our institution. We subsequently evaluated and recommended repeat surgery by our endoscopic skull base team. We were able to get a complete endoscopic resection which was followed by chemotherapy and radiation therapy. 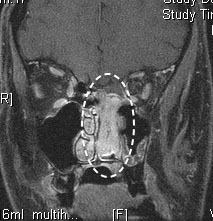 He is currently 5 years out from surgery with no evidence of recurrence (Figure 4). 38 year old male non smoker who presented to an outside otolaryngologist who told patient he had “polyps”. He presented to our institution for a second opinion with suspicious appearance on CT scan this was biopsied and proven to be an esthesioneuroblastoma (Figure 5). The tumor was very small and the patient was concerned about smell loss after reading about surgery and additionally chemo radiation therapy. Given it did not extend intracranially, we performed a unilateral endoscopic excision removing only the right olfactory bulb (nerve for smell), keeping the left side intact. Following surgery he underwent only radiation therapy given the small size of tumor and complete resection. He is currently 2 years out from surgery with no evidence of recurrence and continues to report normal sense of smell (Figure 6).